It is nearing mid-February here in the Texas Hill Country. It’s getting time that we turn our thoughts away from the gloomy days of winter and look for signs of spring. With a mild El Nino influencing the weather, we’ve been fortunate to have a steady supply of rain over the last few months – nothing heavy but enough to keep the ground wet and nourished. As a result, I have more bluebonnet rosettes on our property than in any year before. So I have high hopes this spring will be quite colorful. The first blooms should show up in mid March if the weather turns warm, and central Texas could really put on a show by late March and early April. Keep your fingers crossed! If you’ve been around Austin in the last year, you know about the construction of new buildings. Its nearly impossible to photograph the skyline without having a crane in the image. Still, there are a few unique angles to be found. I’ve spent some time around Lamar Bridge, First Street Bridge, and Congress Bridge in an attempt to capture the architecture with some of the cityscape in the background. 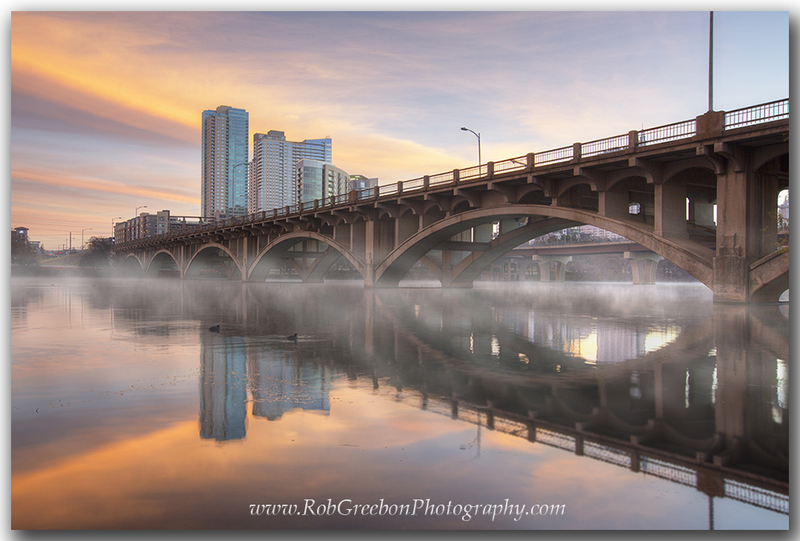 All of these new images were taken early in the morning as fog rolled off the water of Lady Bird Lake. A bird comes in for a landing in the early morning along the boardwalk in downtown Austin, Texas. 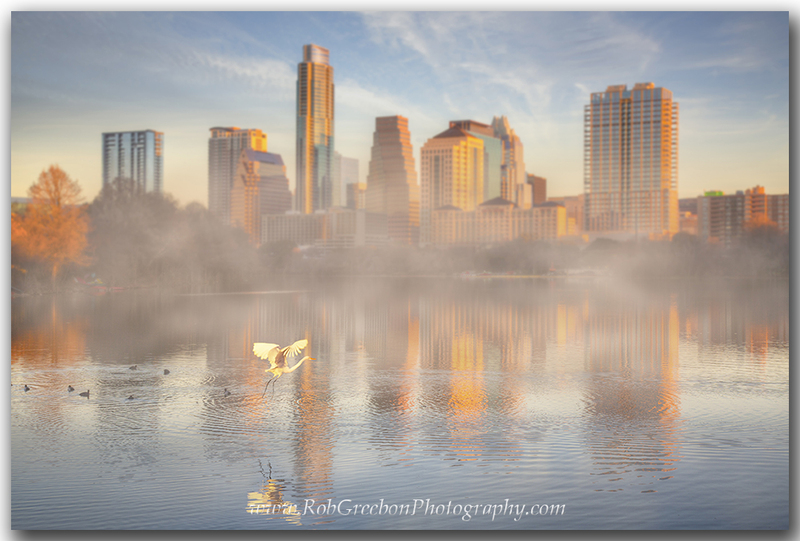 Early morning in downtown Austin brings fog on Lady Bird Lake. Lamar Street Bridge leads to the skyline in the distance. I’ve spent the winter months toiling away at a new website that is aimed at showcasing images and photos from our great state of Texas. The new site should be ready to go live by the end of February if things go right. We’ll see! I’ve also been asked lately by many folks to photograph families and portraits. Because of this demand, I’ve invested in some more lighting equipment and hope to work with individuals on these projects in the coming months and years. Stay tuned.. it will be a busy spring with trips planned to Big Bend National Park, Ennis (for the bluebonnets) and a thousands miles of dirt roads around the Texas Hill Country in search of colorful wildflowers.